VI. Short-Term and Long-Term Memory: Proteins for Coding? VIII. Scotophobin: First Deciphered Word of a New Biological Code? 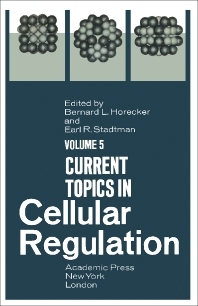 Current Topics in Cellular Regulation, Volume 5 presents the fundamental mechanisms involved in the regulation of diverse cellular activities, including cellular differentiation, intermediary metabolism, and the transfer of genetic information. This book provides information pertinent to the various aspects of cellular regulation. Organized into eight chapters, this volume begins with an overview of the role of phosphofructokinase in the regulation of glycolysis. This text then outlines the structural aspects of phosphofructokinase, its main kinetic properties, and the various mechanisms that have been proposed for its regulation. Other chapters consider the four-stage approach to analysis of control mechanisms. This book discusses as well the regulation of cellular function through the mechanism of protein phosphorylation. The final chapter deals with the pathway for histidine biosynthesis in Salmonella typhimurium, which consists of a series of reactions, each catalyzed by a specific enzyme. This book is a valuable resource for biologists and biochemists.